Teachers, during the school year, might be the busiest of us all—I can say this because I’m married to one. With such a jam-packed school year for her and a busy calendar of extra-curricular events for myself, figuring out dinners for the two of us that weren’t mundane or expensive was a challenge. So in January, my wife pitched Blue Apron to me as a solution. She didn’t need to do much convincing—I had been considering them already, too. It’s now mid-April, and we’ve only skipped two weeks of deliveries. We’re hooked. And from a marketing perspective, I’m impressed, and I want more companies like Blue Apron. When you open your box, you’ll find everything needed neatly organized and labeled—which apparently does wonders for my wife’s OCD—with recipe cards doubling as checklists to make sure you have everything for the week. 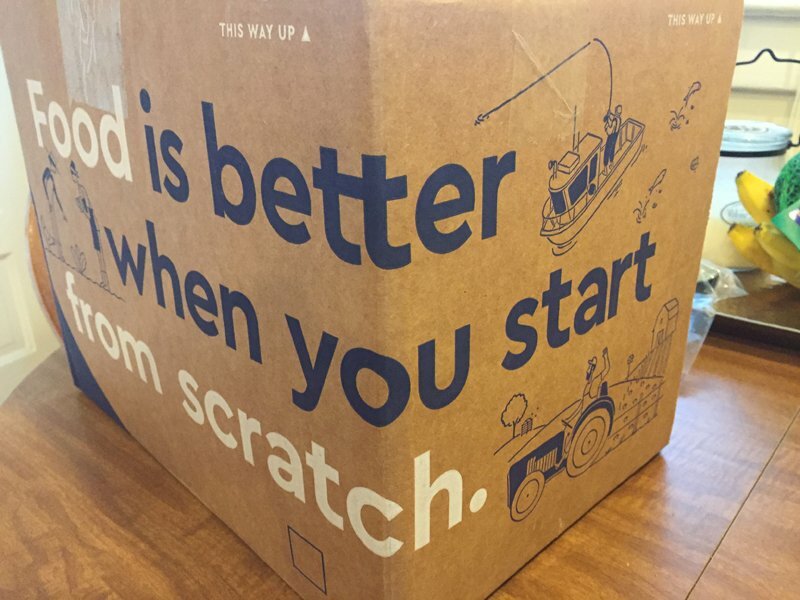 Outside of the food and recipes, they do a fantastic job educating their customers while they have their attention during the unboxing. Some pamphlets have focused on how farmers care for their livestock and how their practices impact flavor and nutrition, the importance of soil, and how to grow your own produce. On our third delivery, we were shorted two ingredients. After my wife emailed their customer service team, we had a $30 credit added to our account. Terrific hugging from that team! At home, you’ll prep and cook while following handy recipe cards, complete with images, time-saving tips, and more. 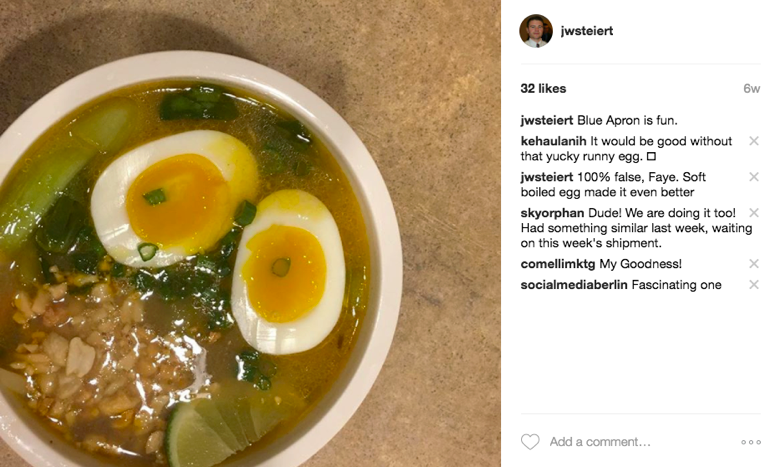 It even has social calls to action throughout the recipe card, encouraging the home chef to share their creations with the world—because a meal is not complete until there’s an Instagram post to prove it. Being a part of your customer’s experience while your customer is engaging with your product or solution is a major factor in succeeding in today’s competitive environment. We need to be useful, clear, and concise at the exact moment our customers need us. Otherwise, we risk them finding someone else to scratch that itch. 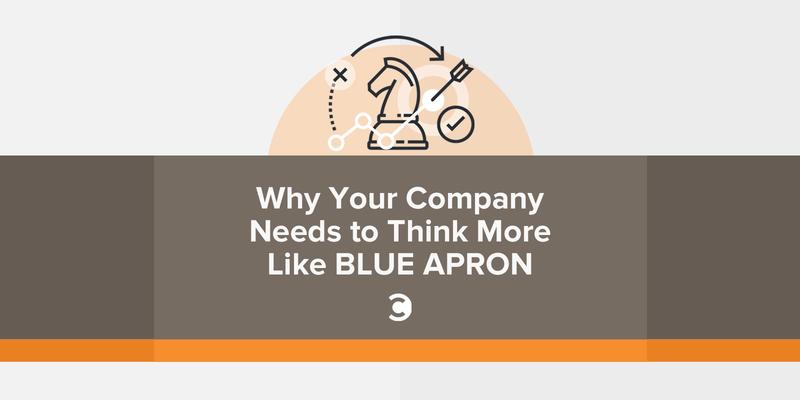 When it comes to advocacy, Blue Apron’s done a great job of empowering their home chefs to share tips and advice with those getting set to cook that recipe. They’re leveraging Facebook to act as their community forum brilliantly—why bring them elsewhere when their customer is already on Facebook? 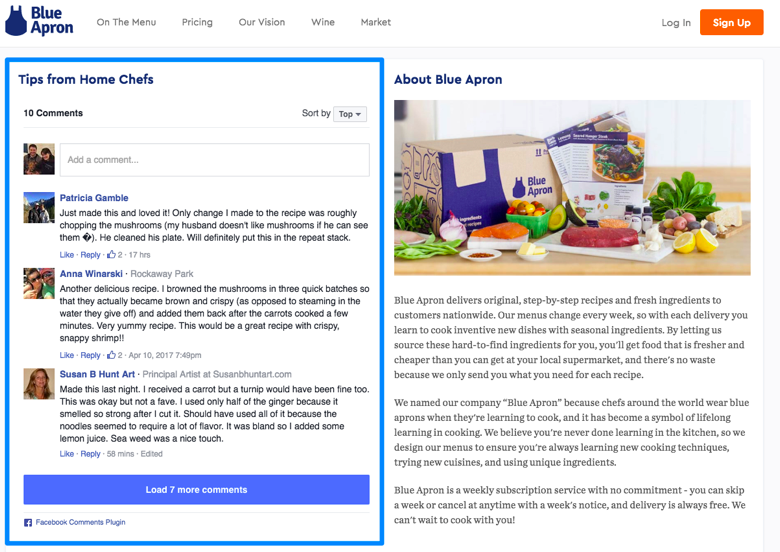 These comments are visible across Facebook which acts as share and social proof for anyone considering trying Blue Apron’s services. By the way, those same handy recipe cards my wife and I use to guide us through a recipe we’ve never cooked before are available on Blue Apron’s site for free. So why do we keep spending $60 a week when we can follow the recipe for free and buy the ingredients at the grocery store? Just like Jay detailed so well in Youtility and again in the early pages of Hug Your Haters, people will pay more for an experience, especially one that is valued as a convenience. 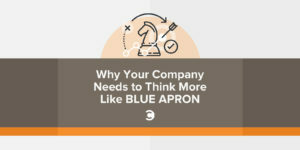 Time, money, and over-thinking are the problems Blue Apron has solved for my wife and I over the last few months. We now spend more quality time with each other without awkward Sunday afternoon conversations over-thinking the upcoming week’s dinners and without spending a ton of money on ingredients we’d use once and forget about. When you make your customers happy and proud over the decision they made to be your customer, you win because they did. All customers experience the same kind of dilemmas and needs that my family has encountered. Businesses need to be proactive in solving these problems. The companies who are able to identify, solve, and communicate their solution the best to their customer base in a moment of relevance will win. How can your company provide a more complete solution for your current and prospective customers? Which companies do you feel offer the best out-of-box solution in your day-to-day life?